Resurrecting your career after a long break is not easy. But stories of those who went through the transition can teach us how to better navigate a way back to work. No one wants to have to choose between staying on their career path and tending to urgent personal needs that may crop up. But that’s the essential situation faced by countless professionals, given how difficult it has become to return to work after even a couple of years away. In addition to degrading employees’ quality of life, this blind spot in the business world costs companies dearly due to the premature termination of far too many promising careers. It’s also a major setback to gender equality. 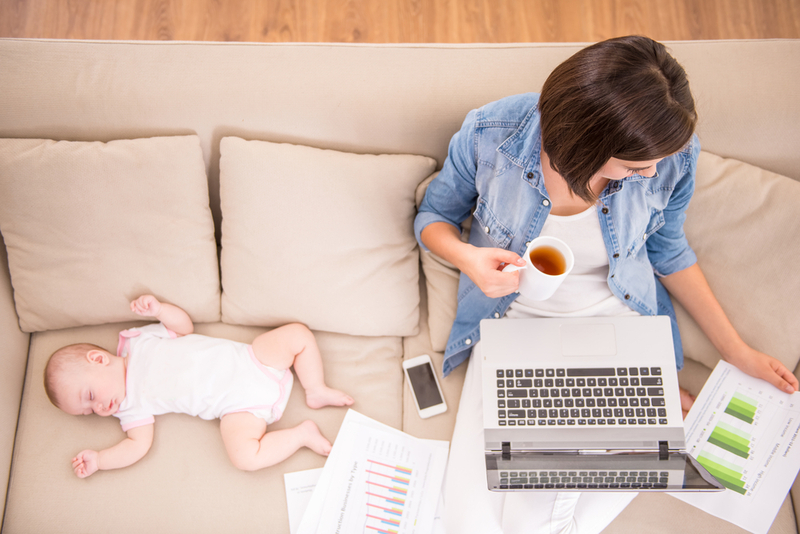 Nearly half of all women who leave work to raise children don’t go back, which is especially troubling as women constitute 95 percent of those who take a career break for child-raising or family caring. This statistic was related to us by Julianne Miles, co-founder of a revolutionary firm called Women Returners, which exists to facilitate the return of women to the workplace. Sadly, those who successfully resurrect their careers after a hiatus are the exception rather than the rule, but we interviewed executives who have done it to find some tips for returners. It never seems to be as simple as picking up where they left off, but the coping strategies they developed made their careers even stronger. Argyro had no intention of leaving her job as general manager of the Greek subsidiary of a major travel retail company, until she learned she was pregnant with her first child. This came at the same time that her company was being acquired. Her reluctance to be in the post-merger structure, as well as to sacrifice time with her baby led her to part ways amicably with her employer, but she was not planning a long break. However, another pregnancy prolonged the gap. She mulled starting over with a “second career”. This reflection showed her that what she most enjoyed was “creating beautiful teams of talented people and helping them grow”. So, she did a second degree, this time in Strategy and HR Management, while still pregnant for the second time. After a failed attempt to return to work after baby number 2, Argyro managed to get back after number 3, once she had realised that she needed to use her consulting experience as the lever. She spent one year happily developing her abilities, after which she was called by a London-based multinational spirits and beverage company, to work as HR Director for Greece. From there, she quickly advanced to roles of increasing seniority within Europe. Reflecting on her career and life journey, Argyro says her husband’s support has been crucial. He is a very participative parent, and things are equitable between them. They work as a partnership, and balance and development are a priority for both of them. Tim also made a choice to value parenting over corporate life, though in a very different way and order than that used by Argyro. One evening, he came home from a long business trip to Africa, to find a little note on his bed from his nine-year-old daughter, asking that he attend a “meeting” with her ASAP. The next day, she explained, “Daddy, how can I love you if I never see you?” Tim resigned only ten days after this bombshell, fortunately in the knowledge that his wife had been offered an opportunity to take a role in the European headquarters of P&G. Serendipitously, he was contacted by a consultancy firm and he took on a project, which led to another, and now he is helping them to develop their business. This is facilitated by a very actively present grandmother, who supports and helps out willingly. Tim says his experience as a full-time dad made him a better decision-maker. He says he is much better at identifying and setting priorities, and bringing the right mix of emotion and practicality to any choice he faces these days. When quizzed on how this works out for the couple, he is unequivocal: It only works if the two are perfectly aligned, and it helps tremendously if there is capital already saved so as to avoid a drastic drop in lifestyle. As he says “nobody is deprived, but we do control our spending in a way we would not have done a few years ago”. Shortly after 9/11, Mui Gek, a Singaporean national with a successful career in retail leasing, and her French husband decided to move together to his native country. She aimed to use her experience to enter the French luxury goods industry, starting out by studying the language and earning an MBA in a local business school. It was a mammoth task for Mui Gek to find a job in a tough market, as a visibly and audibly very foreign person in a provincial French city. She created from scratch an extensive network, from her immediate friends, MBA teachers and family. Her tireless efforts netted a job with a family business, overseeing a large project to explore the Chinese market for shopping centres. While pregnant with her first child, Mui Gek and her husband decided she would take a break to have the baby and to figure out her next move. However, less than two years later, they found themselves with a toddler and newborn twins. When the twins were coming up to two, she started to feel it was time to return to work. Yet again, networking skills came to the fore. This time, it led to an introduction to none other than Antoine Tirard, the co-author of this article, who was at the time recently appointed as head of talent at LVMH. Mui Gek’s mix of skills was unusual, to say the least, and not one that neatly fit with any particular vacant job in the luxury group. Her difference was that, beyond her obvious real estate and retail experience, she had doggedly stayed up to date on workplace issues, on fashion, luxury and more. This was the clincher. Eight months later, she received a call from LVMH who had decided to create a new role as the company felt their real estate strategy lacked coordination, and an expert hand with negotiation and diplomacy skills could be a great asset. She got the job. Networking furiously to make friends and allies and using her unique blend of knowledge, passion and persuasion helped her create a hitherto unheard-of collaboration between previously hostile, competitive brands, and she has been offered increasingly interesting developmental roles. We are aware that the people profiled above are some of “the lucky ones”. They have been supported by family and comfortable finances, however difficult this balancing act may have been. The balance is a lot harder to find if you are on your own and there is no loving grandma around to babysit–- a reality faced by millions. But generally, hope is improving for anybody in this situation. A growing number of financial institutions and professional service firms—including Morgan Stanley, Credit Suisse, RBS, JP Morgan, and Lloyds Bank— have introduced ”returnship programmes” for high-calibre professionals who are ready to return to corporate life after having hit the pause button. So far, Goldman Sachs in the US reports offering permanent positions to fully half of their returnship participants. More recent data on UK returnship programmes suggest that retention rates may be even higher. Clearly, there is much to be gained and to be done: both for corporations who could undoubtedly make these returns easier, and for the returners themselves, who must battle history, tradition and tough circumstances with courage every single day. 1. Clarify your goals – take stock and use your time to explore what you want to do and where you want to be in ten years’ time. 2. Update your skills and knowledge – stay current in your field, upgrade your credentials, invest in relevant training, do volunteer work to learn or hone skills. 3. Use creative job search strategies – classic job search tactics won’t work; headhunters will ignore you. Mine neighbourhood or local job opportunities, investigate ‘returnship’ programmes. 4. Network in depth – reactivate and broaden your professional and personal networks for feedback, support, advice and leads. 5. Seek family support – secure financial, mental and emotional support from your partner, agree how you will rebalance or switch times and roles, look for help from participative parents. 6. Boost your confidence – be clear about your strengths. Emphasize the value you can bring to an employer rather than your time away. 7. Be prepared to compromise – Get ready to adjust your standards of living. Consider part-time, inter-im or freelance work. 8. Build resilience early on – be prepared to navigate multiple career breaks and non-controllable events. Learn to develop a flexible attitude. Download the full article by Antoine Tirard and Claire Lyell “Finding a Route Back to Work After a Long Career Break”.